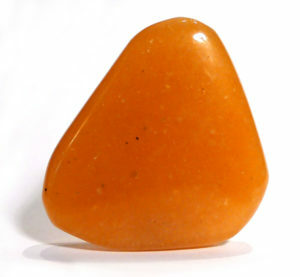 With peach aventurine (also known as orange or red aventurine), the clearing and balancing characteristics focus on the lower chakras, from the Solar Plexus down. It is still harmonising, and adds grounding to the mix, making it surprisingly calm given its orange colour (which is usually considered vibrant and energising). It releases and clears old, held energy from the Solar Plexus, especially tension and anger, and treats digestive complaints, such as IBS. Aventurine is a variety of quartz. The name was originally a trade name, but is now widely accepted as the mineralogical name. It forms massively (with no distinct crystal faces), and is characterised by its spangled or glittery appearance, which is due to the inclusion of other minerals. It is most commonly dark opaque green, the colouration and sparkle due to included fuchsite (green mica), and it often has pyrite inclusion as well. 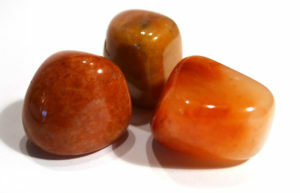 Brown aventurine is coloured by pyrite, and red aventurine by hematite. It also occurs in yellow, orange and blue. It is generally sold as a tumbled or polished stone, or in jewellery. In the past, the name aventurine was also applied to certain varieties of feldspar, sunstone in particular. The name comes from the Italian ventura, meaning “chance” – as in it was found by chance. There are no traditions associated with aventurine.